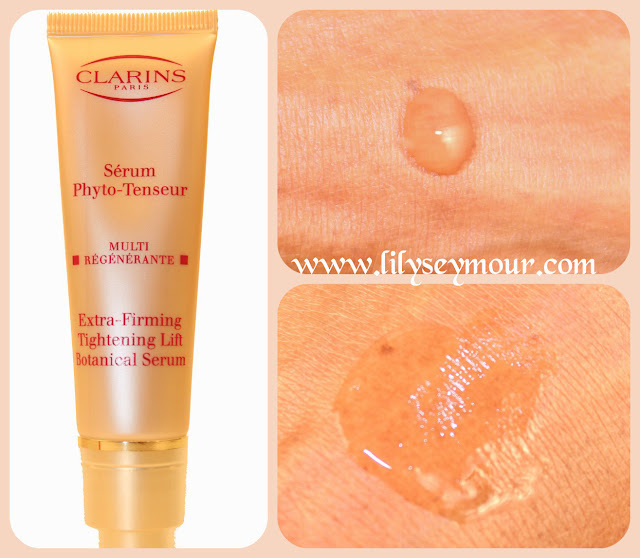 I received a sample of the Clarins Extra-Firming Tightening Lift Botanical Serum but i'm not sure where, probably Sephora. Anyway, I decided to use it one morning underneath my primer. To my amazement I noticed a few things immediately. First, my large pores were closing up, second, the lines in my forehead were disappearing and lastly, the skin around my eyes became slightly tighter. I don't have bags or puffiness but I do have fine lines due to aging but I was sold on how this product made my skin look and feel. The packet had enough for two applications so I decided to try it again the next day just to be sure what I was experiencing was real. Well, I noticed the same things happening again and I liked the results so I decided to purchase the full tube. This product contains 1.0 Fl Oz and cost $87.00. The ultimate non-surgical “face lift”! Clarins’ concentrated anti-aging serum has a firming and toning effect on the contours of the face and neck. Soothing botanical blend — including firming Oat Sugar and line-minimizing Hibiscus — creates an invisible "mesh" on the skin’s surface for a tightening effect and helps tone and enhance facial contours. The natural alternative to surgery, lasers and injections. I'm not trying to sell it, i'm just posting my results for those of you that have mature skin and might be looking for something to lift and tighten. Prior to this i've been using Shiseido Bio-Performance Super Corrective Serum which I reviewed here. Serums are usually quite expensive but in my opinion, they last a really long time, about 3 months. I hope this review was helpful!